In present day, a teenage girl visits a statue of a writer in a cemetery, and begins reading a memoir written by 'the Author' about one of his visits to the Grand Budapest Hotel in the sixties. He discovered that the hotel is now struggling for business, but ends up having dinner with Zero Moustafa, a man who claims to be the previous owner of the hotel. His story begins in 1932, where he (Tony Revolori) began working at the hotel as a lobby boy, forming a close friendship with highly commendable concierge Gustave H (Ralph Fiennes). After Gustave is framed for the murder of one of his most beloved guests, both he and Zero must flee the authorities and prove Gustave's innocence. This is the first Wes Anderson film I have seen, so this, for me, was more of an experience than a simple cinema trip. However, I have heard from many that this is one of his very best, so perhaps this serves as a worthy introduction to his uniquely stylistic approach to film-making. The Grand Budapest Hotel is an extraordinary treat, and in numerous ways. I believe its strangely misleading trailer to be a complete misfire. Whilst its odd structure and visual approach reflect that of the film wonderfully, it doesn't quite encompass Anderson's unique flare for both visual and written comedy, which is likely to put off a large number of casual viewers who might find something of interest here. A solidly artistic film packed with innovative and cinematic excellence that is possible to attract a wider audience is not an easy feat, but here, Anderson has truly nailed it. 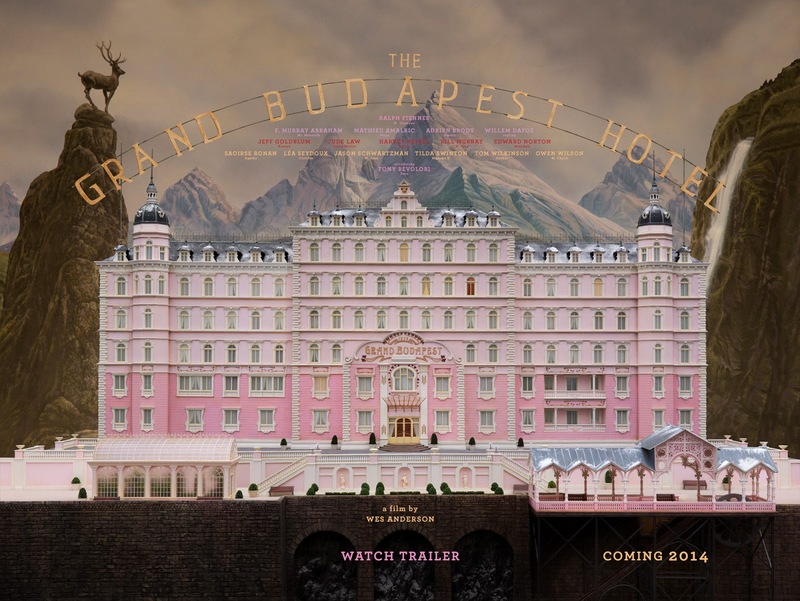 Visually, The Grand Budapest Hotel is consistently pleasing. Loaded with bright colours and smart contrasts, the screen lights up in front of you, bringing more life to the fictional state of Zubrowka. Anderson's interpretation of aspect ratio also proves a key factor. We begin in present day, with the frame filling the screen at 2.39:1. When we drop back to the 60s the frame narrows to 1.85:1, until we reach the main story of 1932 which unfolds in 4:3. This notion proves Anderson's unique talent for innovative film-making; whilst many utilize colour correction/grayscale for flashback scenes, Anderson plays with aspect ratio. Thus, the majority of the film takes place with the aspect ratio of a standard computer monitor. But you forget this. The film is so beautifully shot, with such exquisite set design and such a pleasing colour scheme, the film expands into the room around you. It really is marvelous stuff. Where The Grand Budapest Hotel also exceeds is its script. Whilst flavoured with sophisticated writing that occasionally (if not often enough) borders on challenging, Anderson has created a film that is as visually funny as it is through its writing. The humour here is smart; Anderson doesn't want his audience to come and laugh at the characters, he wants us to understand them. And with a story so fundamentally difficult to relate to (perhaps until the film's final moments), the humour is needed to make us feel for his characters, to make us want to follow their journey. With jokes that range from unintentional finger amputations, to a mid-battle prayer, to a plummeting cat, the comedic quality here soars. However, this is not Anderson's script's only achievement. As previously stated, the characters here are difficult to empathize with. This is, I feel, an intentional move by Anderson. He is one of few directors who attempts to challenge his audience; he wants us to work to like Gustave H. Despite the film's incredible acting from all involved, Anderson accomplishes this effortlessly, and this pays off in the film's superb final act. When the emotion comes in, and we begin to understand the characters motives and feelings, there are some scenes that pack an emotional punch. We hear of the deaths of characters who are given under 15 minutes of screen time, but we care. We have learnt to care; Anderson has taught us. The Grand Budapest Hotel is a roaring success. From its visual flare to its comedic brilliance, this is one of those films that really offers up something for everyone. But, as stated earlier, this is one of an extraordinarily low number of films that apply to both fans of art house cinema, and more mainstream films. Its sheer uniqueness in that respect gives me hope for the future of the film industry. Whilst I bear no grudges towards conventional modern cinema, it cannot be said that blockbusters offer the same level of cinematic quality as the more artistic films. Whilst blockbusters are undeniably vital for the film industry, to see a wide release like this combine the elements of conventional cinema and innovative art house is truly refreshing. Wes Anderson is, as of now, a director I am relatively unbeknownst about. I don't imagine it will stay this way for long. To Summarise: With its unique approach to visual style, sharp comedy and eccentric writing, The Grand Budapest Hotel is a flawless combination of all of cinemas's greatest attributes.